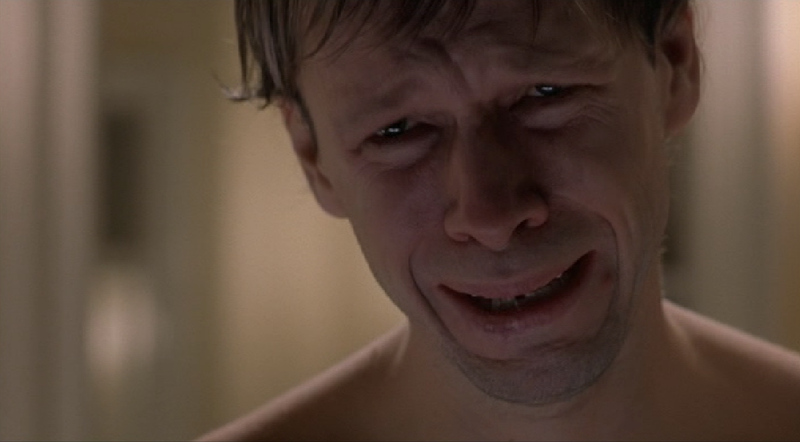 Though I couldn’t outright say that The Sixth Sense is a horror film, at least in the traditional sense, it was somewhat of a rite of passage for me. Funny story — My mom had seen it before me and thought that I would possibly love it, if I could handle it. I was about 13 at the time, and so, like the self-confident early teenager that I was, I decided to go with her… but I was terrified to see this, to be quite honest, if only because her description of it was so scary. I wasn’t a horror fan at the time and hadn’t really sought out any scary movies in my life, so this was a new experience for me. And… Well, I’m not going to lie — I ended up seeing Runaway Bride one auditorium down because I chickened out mid-previews. Honestly, I’ve never felt more ashamed to admit something related to movies quite like this little secret I’ve been keeping, but it’s true. I was a wuss. Luckily, my mom was nice enough to let me have a second go and saw it again for the third time, this time with me firmly planted in my seat. Imagine how dumb I felt when the movie was over and all was revealed, including how not-terrifying the movie actually turned out to be. (My mom is apparently a horrible exaggerator.) 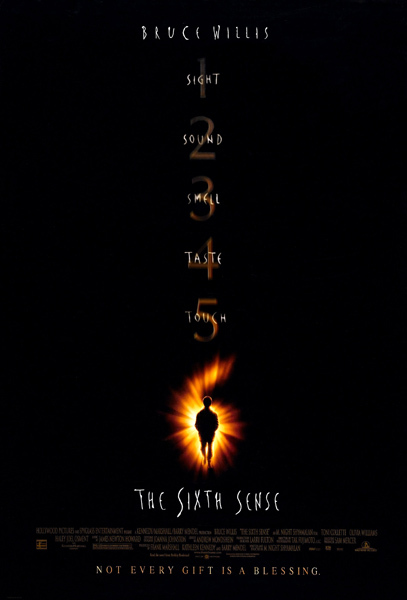 Don’t get me wrong, being a wuss, The Sixth Sense was still a relatively intense film for me at the time, but it was so intriguing in its concept and revelations, with a conclusion so mind-bendingly awesome, I was able to endure it. It’s easy to rank Shyamalan (whose first name is Manoj, but whose second name is not actually “Night,” in case you were wondering) as one of the worst major filmmakers of recent times, and given his recent works, that badge wouldn’t necessarily be a mistake, either. But I would challenge you to go back and watch this film again, especially if you haven’t seen it in quite some time, as I suspect many have, and really think about why studios keep giving him a chance based on the quality of this film. It’s not every day that a film commits a quote quite as instantaneously recognizable and enduring as “I see dead people” , and it’s even rarer still when certain events in a film’s story becomes quite as big a phenomenon as this film’s did. It’s one of those great moments in film that really does deserve to be preserved for future generations to experience without spoilers or any prior knowledge. Given that 13 years have passed since the first time I saw this film, meaning that anyone born at the same time as the film’s release is now the same age I was, I’m going to presume that, given the amount of time, these mysteries are now regaining their power, and so I will refrain from addressing any such things in the hopes that someone out there will be able to have the same experience as I did, thanks to my mom’s tight lips. The performances in the film are astoundingly good. 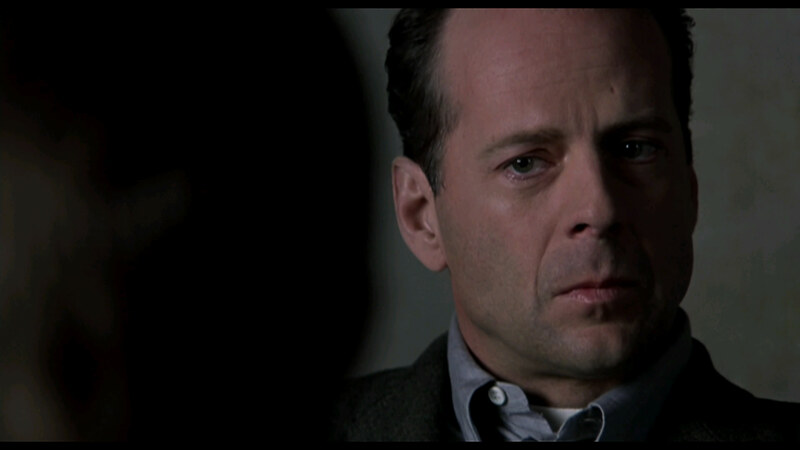 Bruce Willis, as child psychologist Malcolm Crowe, shows that the actor most certainly has the acting range to play more than just action heroes by giving Crowe a gentleness and brokenness that comes from having failed one of his former patients, driving him to now seek redemption in helping his new patient. Toni Collete as the distraught single mother trying to understand her troubled son all on her own also grounds the film emotionally, which is very important in a supernatural thriller. It’s to Shyamalan and Collette’s credit that they don’t make her out to be any sort of tired or clueless stereotype. Here is a woman who is genuinely struggling and trying to make the best of a situation, and her scenes with her son are amazing, even when there aren’t any words being said between them. 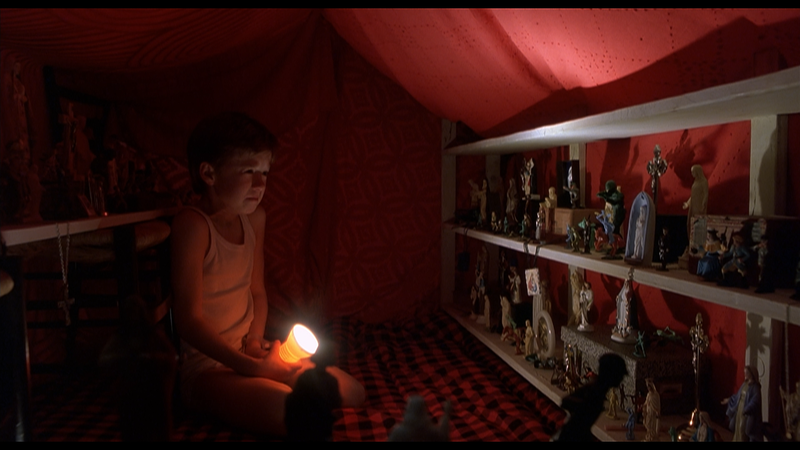 Even more amazing, however, is Haley Joel Osment’s Oscar-nominated performance as Cole Sear, the young boy who has spent his life being tormented by terrifying visitations by ghosts. Child stars are a dime a dozen, especially with the Disney Channel seemingly bursting at the seems with their product, but it’s rare to encounter one that is so believably real and as moving in their performance as Osment was here. Not even Dakota Fanning has an Oscar-nomination under her belt. There’s amazing depth to his line delivery and body language, and though he was only about 10 at the time of production, he shows off an understanding of his character that were well beyond his years, which basically makes the Tommy Tammisimo child actor character a bit more amusing. Shyamalan shows a subtler hand here than he does in his later thrillers, and for those who only remember him for the telegraphed and idiotic twists of The Village or Lady in the Water, The Sixth Sense, as I said before, will easily show you why studios still try to see if Shyamalan can strike gold the same way he did here. In retrospect, there are a few instances of his future faults coming through — most of the few comic relief beats feel inappropriate, and scenes such as where the mother is having nightmares could’ve used a subtler hand — but overall, the film is smart at spacing out the big scares, which primarily serve their purpose in establishing just how horrific Cole’s experiences are without being exploitative or gratuitous. Their impact is lasting, and, in the context of the film’s revelations, they take on an entirely new light upon subsequent viewing, which is why I feel that it’s so important to let viewers have an untainted first viewing for this film, even to this day. The cinematography and score stand out in a film filled with standout elements. Set in Philadelphia and featuring significant and seemingly purposeful grain (though I admit, I was watching an upscaled, early DVD), The Sixth Sense is appropriately dreary in appearance and accentuates the brooding subject matter. James Newton Howard’s score is similarly eerie, mysterious, and even mournful, and yet, when heard in the context of a second viewing, it’s also somewhat beautiful, too. Again, this is not a film that’s solely out to frighten or thrill, and once you get through it, you’ll realize that it’s really about something that can be easily applied to your own life. Again, I’d love to state what my ideas about that are here, but I am going to avoid even hinting at something that could spoil the ending. I’d really rather not be the one to ruin that first time viewing for you. If you can muster up the courage to watch a ghost story with some jump scares and mildly ghoulish imagery, you really should watch The Sixth Sense — even if you’re not a horror fan or don’t consider a roller coaster ride of frightening images to be the definition of a good time. I guarantee that, by the end of the film, you will find The Sixth Sense to be a lot more gentle in how it treats you than most other films of this sort. You’re not watching The Ring here. The Sixth Sense remains one of the more original ghost story movies out there still, and its story will have far more of a meaningful impact on you than any jump-scare packed movie ever will. And I know from personal experience that its thrills are a whole hell of a lot more easy to endure than anything that was put into making Runaway Bride, too.